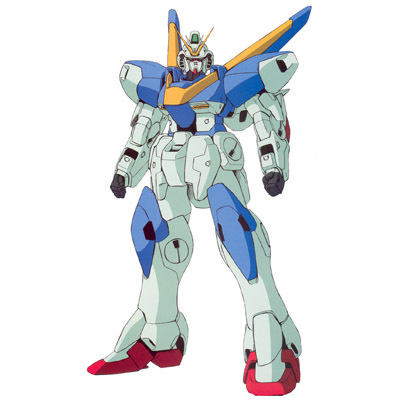 The V2 Gundam, at first, isn't very special despite it's Wings of Light attack. However, later on it gets a few modules which really increase its potential. The VF-11B is fantastic, and in my opinion it barely edges out the YF-19 in general usefulness because of it's post movement attacks and Reactor Missile. : Zondar Epta... That's the relay station under the control of 1st-Rank Director Biram, who reports to Kashim. : Yes, sir. But, we seem to have lost contact with them, much like with Fort Severn. : That base was attacked by the Irregulars and destroyed. : So, then... What would you request of us? : I'd like you to bring me one of the Iron Gear's crew. : Rag Ulalo, or Elche Cargo... Either one of them will do. I leave the method up to you, but it is of vital importance that no harm comes to them. : Wouldn't it be more reliable for you to invite them here yourself...? : They're aware of the Innocent's goals. They wouldn't accept our invitation so easily. : ...Then, could you give us the Irregulars' current position? : They're south of this place, P-Point... Closer to S-Point. : Anything else? If you need backup, we'll provide it. : Then, if you could loan us someone to use as bait? : Fine. We'll put a Breaker named Kid Hola under your command. : I'll be looking forward to good news, Shagia Frost, Olba Frost. : Those brothers aren't Vultures. They're most likely Moon Race. : Wh-what did you say, sir...!? : They probably came to Gallia to get information on the Innocent and the Irregulars. 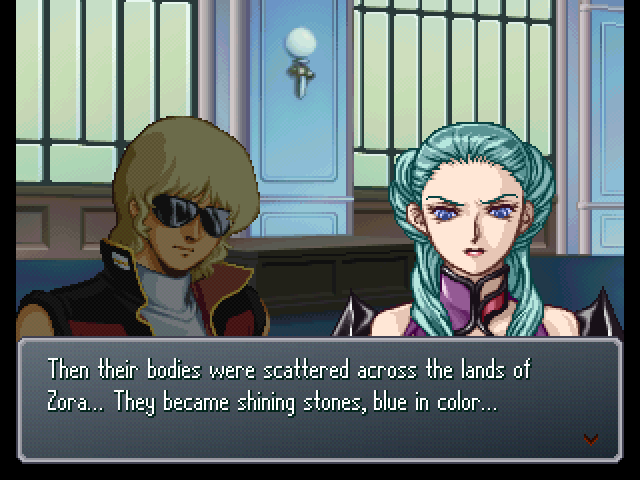 Some time ago, there were mobile suits doing recon at this Point... It could be them. 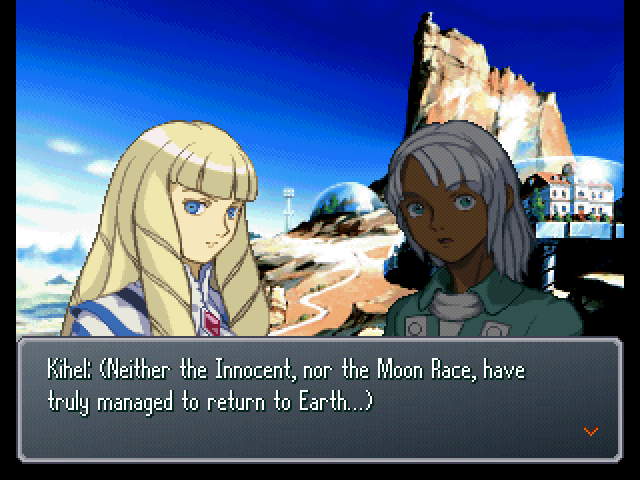 : It appears the Moon Race isn't all of one mind. : Is it okay to leave them to their own devices!? : For the moment, it's fine. 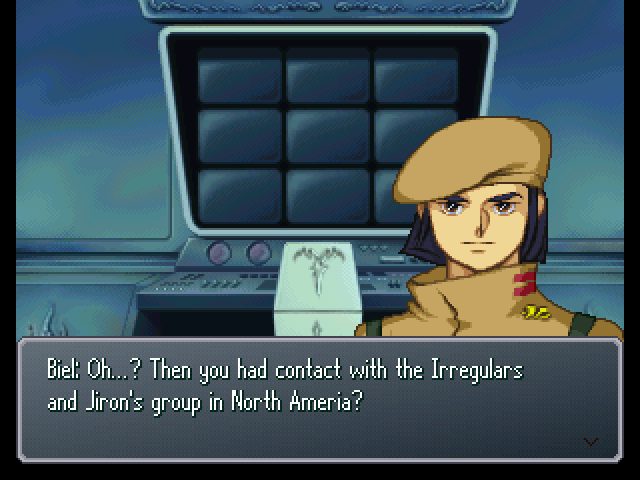 I'm more concerned with the Irregulars. : ...We've gotten reports that the ones who destroyed Fort Severn were also Irregulars. 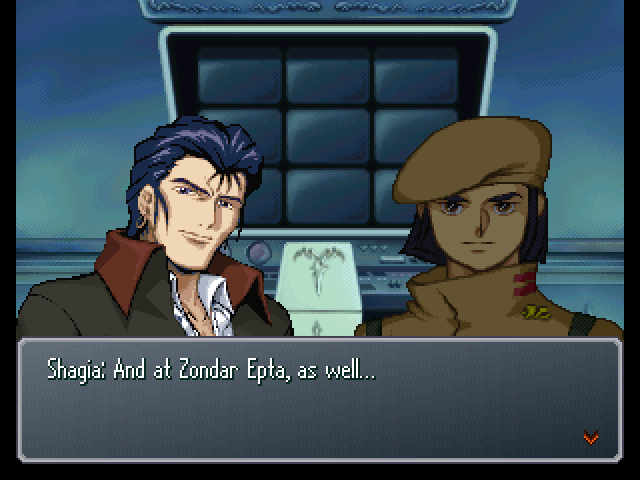 And Zondar Epta, on top of that... It would be dangerous to ignore Jiron's group any longer. : You don't really have a full grasp of what that program is, do you? : I am a first-rank director. : That's all well and good. As long as you're aware of what prospects we Innocent face. : Be silent, Second-Rank Director Dowas. This is a matter outside your jurisdiction. : But, if we keep letting Jiron Amos and those Irregulars run loose... The Innocent will be doomed! 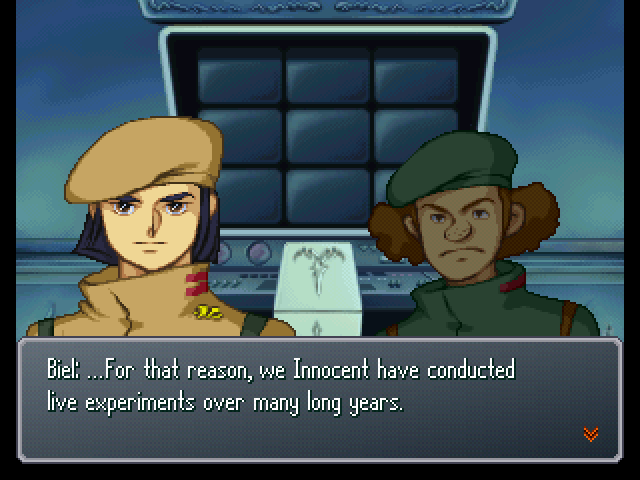 : Dowas... What is the Innocent's purpose? : (.........) ...The improvement of people who adapt to this planet of Zora. : Jiron's group is one example of this. They're an experiment. I think the Iron Gear's crew is exactly what we seek... I don't know that for certain, of course. That's why we need to take a sample and test them. : It's too dangerous! A breakdown of the Civilian Control System could wind up destroying our entire structure! : Structure? Who taught you that word? We are merely to observe Civilians, in accordance with our objectives. Never use that word again in my presence. : Jiron's group is research material. Don't forget to watch them closely at all times, along with the Irregulars. 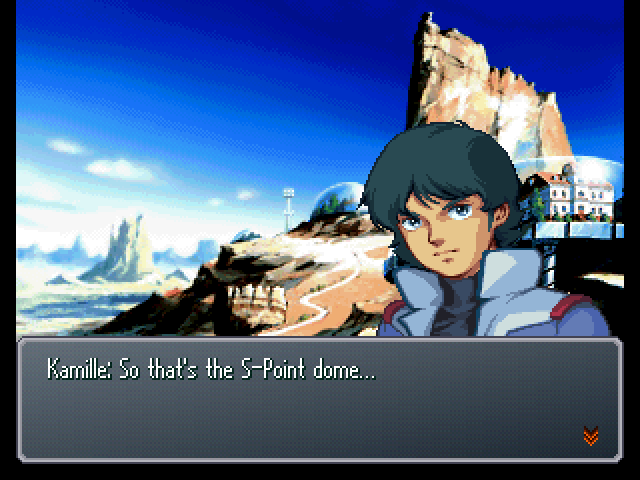 : There's a town inside the dome... It's like a sterilized environment. 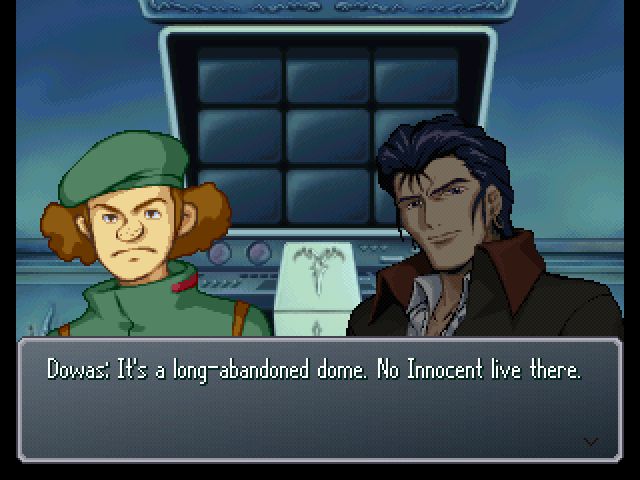 : But... What kind of people would live in a dome like that? : Apparently on this world, that's the norm. : Yeah. 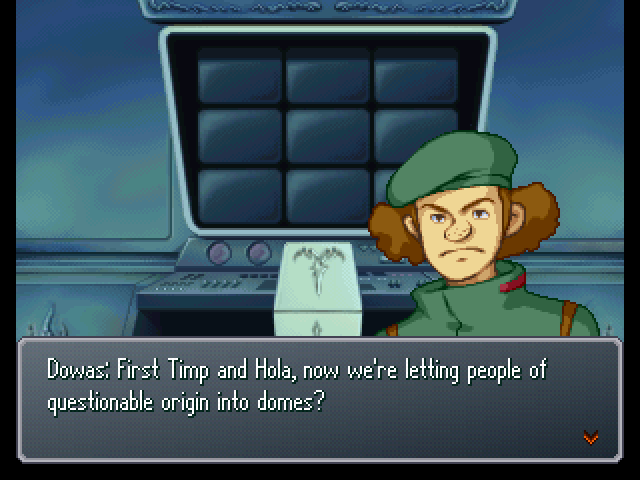 The Innocent don't come outside their domes much. : Though that Egret person had no problem coming out on his own. : Hey, you're right... Come to think of it, he is pretty strange. : ...No, I'm fine. 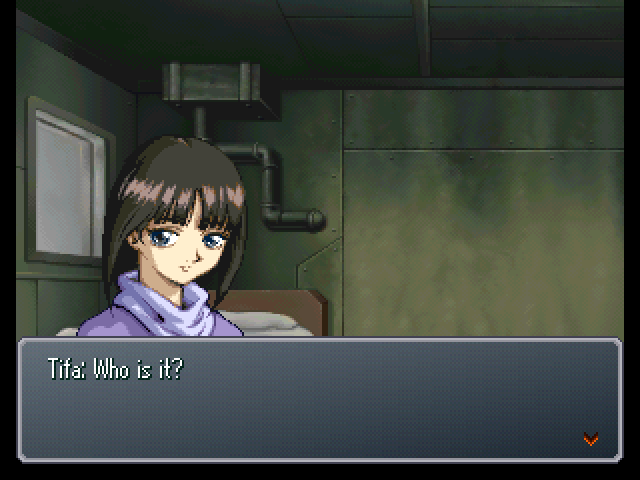 What about you, Loran? : It's like the inside of a space colony. : Yes, I had the same impression when I entered one before. : Still, it's pretty quiet. : ...Now that you mention it, it doesn't have the feel of a place where people live. : Yes, I'm the ruler of S-Point... My name is Magus. 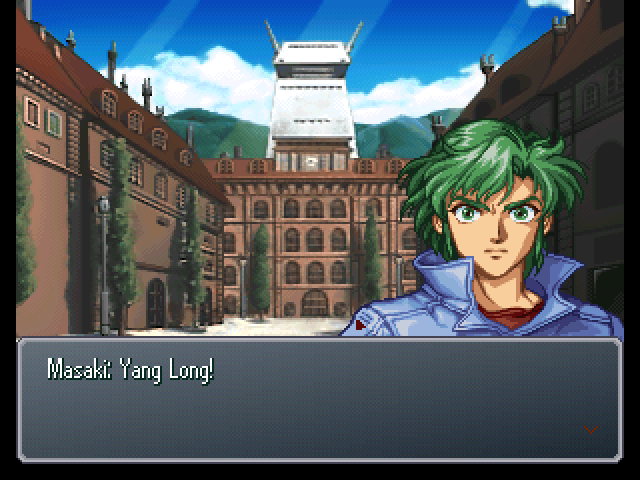 : I'm Bright Noah, captain of the Argama. I hate to rush straight to the point, but I'd like to know why you called us here. : ...Because I wished to meet you all, and make a request of you. : So... What kind of request is this? : (.........) ...There is a group that I would like for you to defeat. 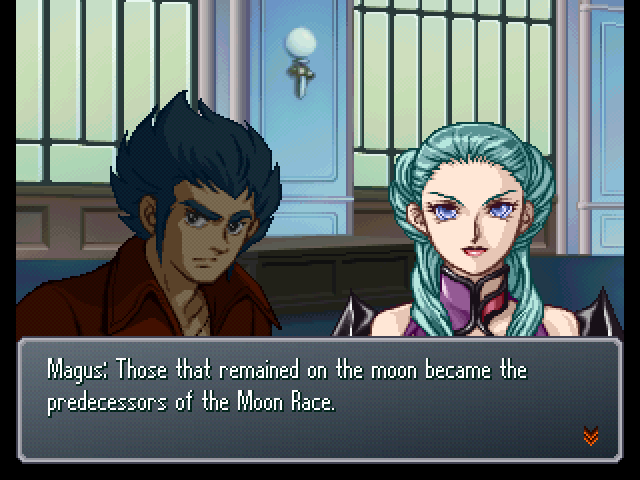 : Is that... the Moon Race? : What do you know about them? : Let me share with you all, a legend passed down here on Zora. : Yes... One which tells fragmented parts of Zora's past... It is said that long ago, Zora was a lush planet, with abundant water and plant life. : Zora was seriously damaged by it, but that wasn't the only disaster to occur. : The result of that was shattered lands, and dried-up oceans. : The demons invaded the surface world, driving many people to their deaths. Furthermore, the demons' poisonous breath caused many plants to wither and die. : And Zora, with no people left, became a planet ruled by the demons. : But upon Zora, saviors appeared. : And ultimately, they succeeded in driving them back to the depths from whence they came. : But their final battle was a bitter struggle indeed... 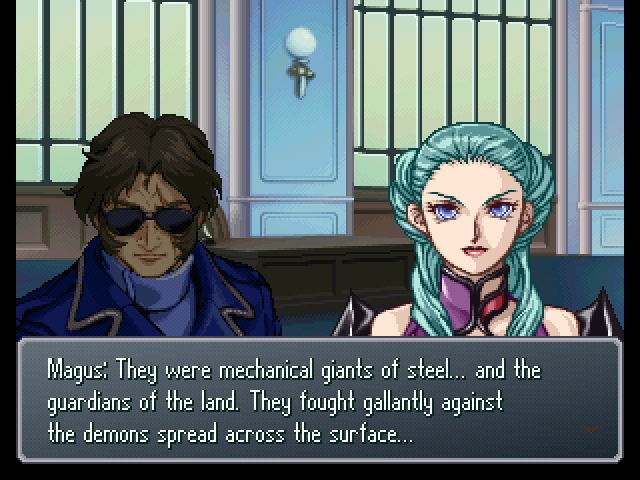 The mechanical giants' strength was completely exhausted. 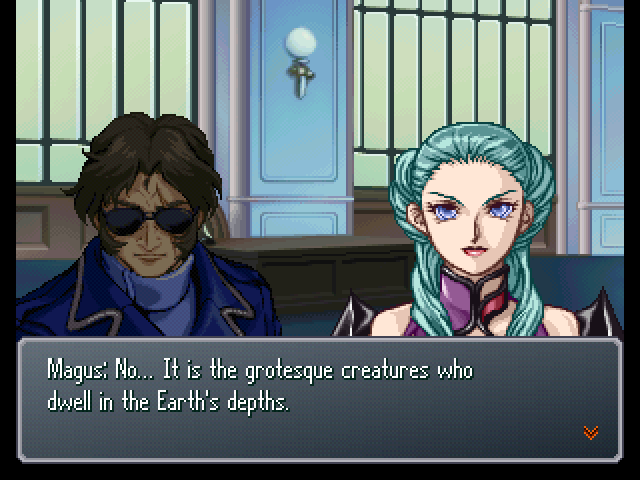 : Then, the Earth was ruined by the ones that came from beneath the ground...? : And the history of war between the moon and Earth came that much later...? : But, what we heard just now was a legend, nothing more. It's not necessarily an accurate reflection of history. : But, the underground demons have emerged from the time of legend. That is an undeniable fact. : If you want that, why don't you take action yourselves? You all have humanoid battle machines as well, like the one Egret pilots, right? : The battle power we possess is... insignificant, at best. We could not possibly hope to fight with them on equal footing. 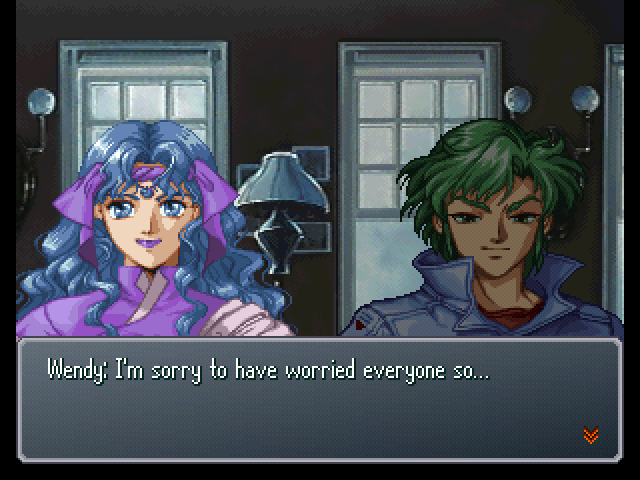 : Masaki... You seem to be doing fine. : Same to you. What have you guys been doing all this time? : It was then that the boy named Egret showed up and escorted us here. : ...That was about three days ago. : But, no need to worry. She's in good shape now, after rest and recuperation. : So the guys here gave her medical treatment? : I'll be blunt and say that I don't exactly trust them. 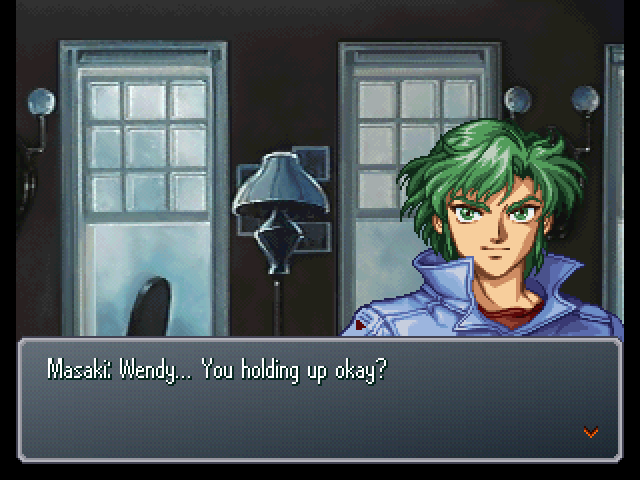 The only reason I came here was that Wendy's condition took priority. 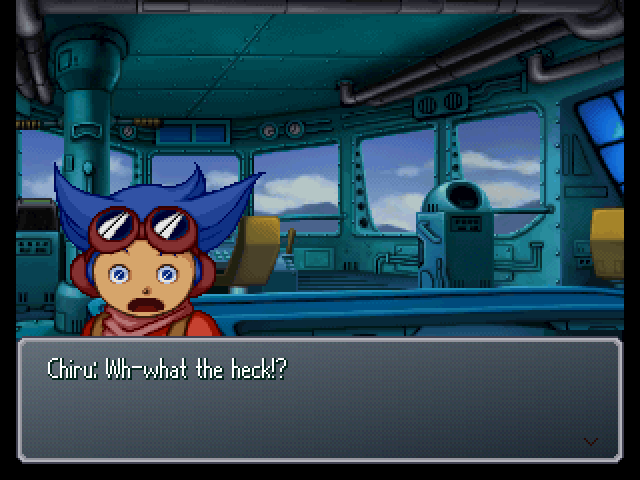 : (.........) By the way, Ryune's... Not here, I'm guessing? 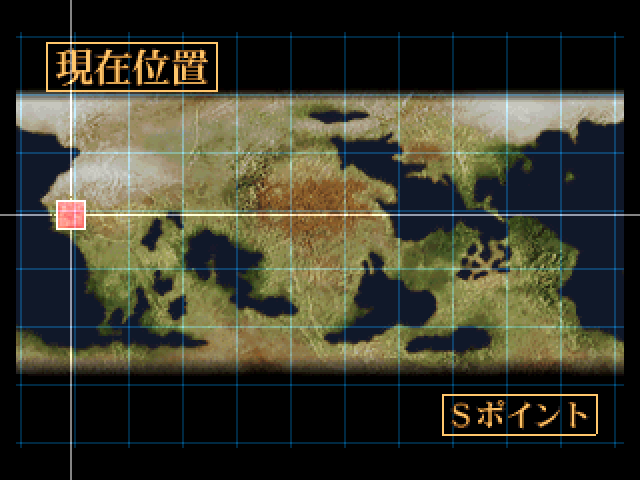 : You guys don't know where she is, either? : But after staying here for a little while, I'm mostly better now. : So, Masaki... How is Cybuster's condition? : Worry more about your own condition first. 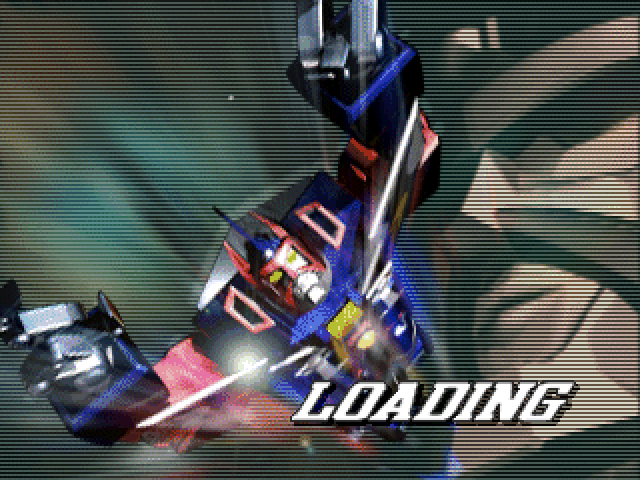 : But that machine is of my own design... And I worry, because it's you piloting it. : What's that supposed to mean, that I'm unreliable? : Nothing. Actually, I have a favor to ask of you. : ...Please, search for Ryune. : ! Yeah... I know. : (.........) I suppose... it worries you? 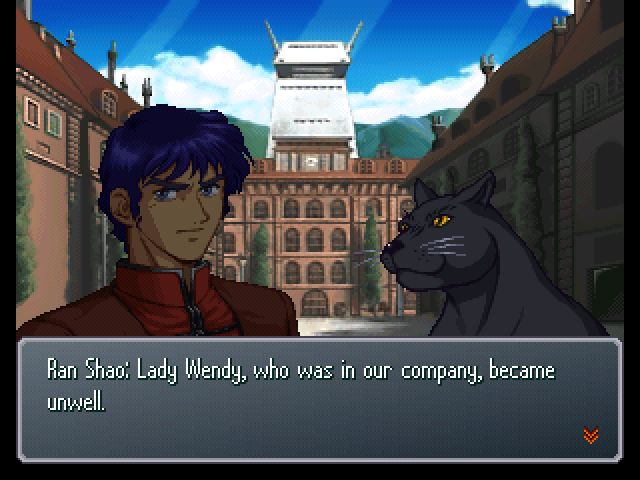 : O-of course it does... We're comrades who've fought together... But, well, uh... I'm sure she'll be fine. She's a tough one. : (.........) You have confidence in her, don't you? : I-it's not like that. It's more like, uh... Like she's someone I'm stuck with. : Still... I suppose Ryune makes me a bit jealous. : My apologies for talking so strangely. You needn't worry about my health. I'm sure that I'll be fine. 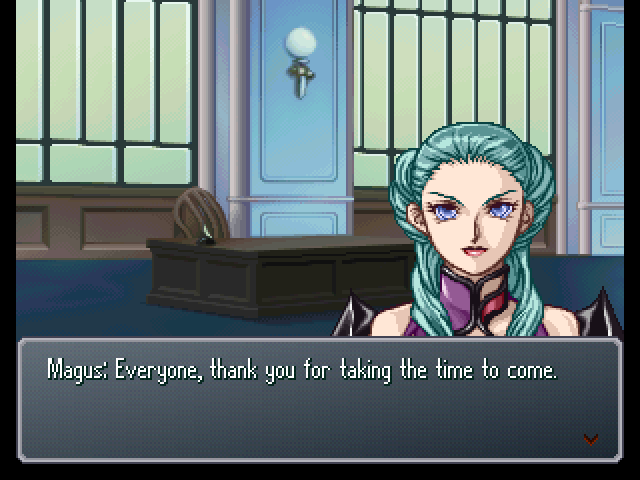 : Magus is with the Innocent. It's very possible that this is a trap. Cooperating at this point would be risky. : So then, aside from the legend she shared with us... We're leaving without any further details about the Black History. : Yes. Apparently, Director-level Innocent can't access their central computer. : We probably won't get any further info unless we agree to cooperate. : What do we do now? 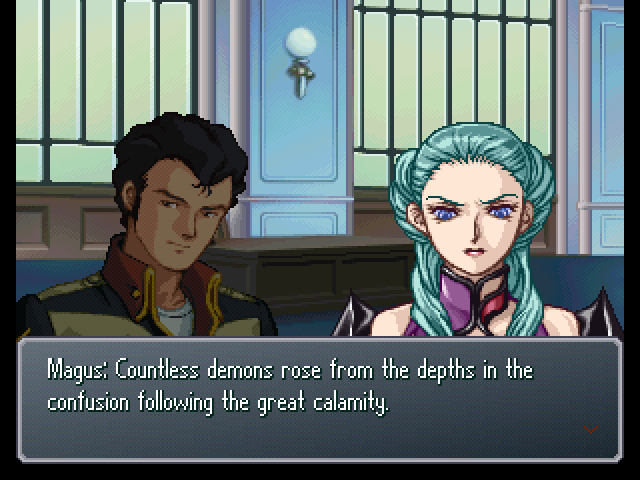 : Although Magus is suspicious, to say the least, she doesn't seem to be an enemy. : Black History aside, I'd like to get more information about the Innocent. : Let's play it cool for a bit. 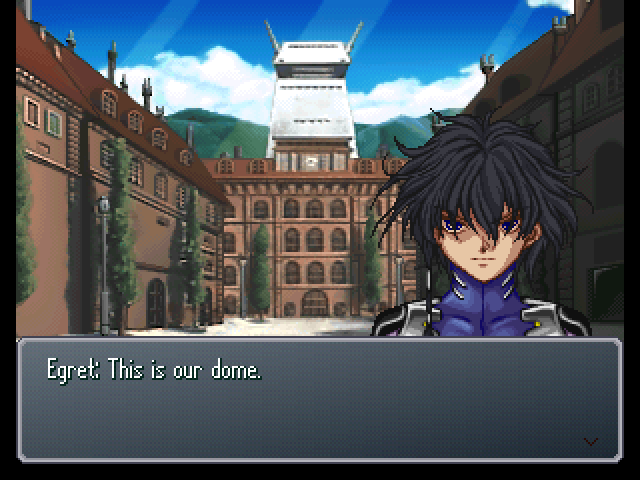 Banjou and the J9 are still inside the dome. They might be able to find something. 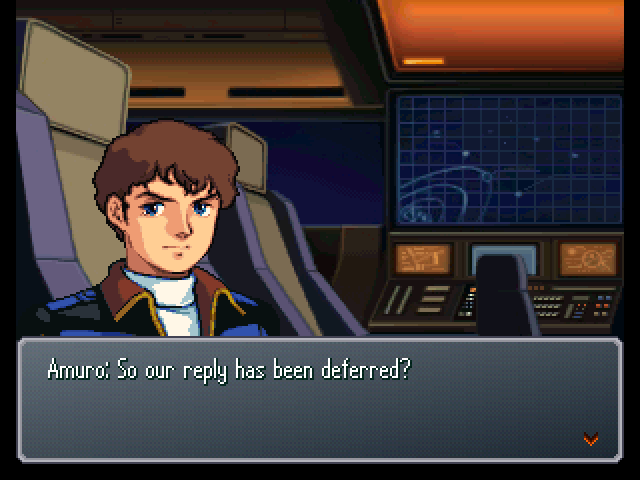 : It's me, Garrod. ...Were you asleep? : What's wrong...? Did something happen? : You had... a dream, didn't you? 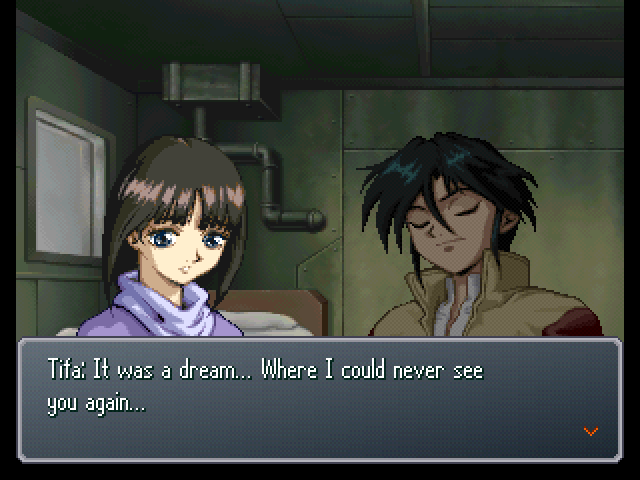 What kind of dream was it? : Was it the future you saw? : Never meet again... What's that supposed to mean!? : Listen, Tifa! Don't move from this spot, okay!? : That was an explosion just now! : What the heck kind of idiot would attack here!? Don't they know where this is!? : C-Cotset! The enemies are walker machines! : It's true! Look outside and see for yourself! : Hey, the little Missy's right. Those're walker machines...! : It's us they're attacking, ain't it? : Gh...! Contact the boss's group in the dome! All free hands, get to a cannon!